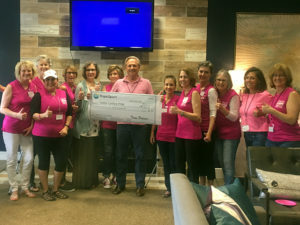 Last week, the clubhouse at The Trails Apartment was decked out in all pink as Dallas United Crew’s PINK Breast Cancer Survivor dragon boat team welcomed new members and hosted the kick-off to their third racing season. What makes this season different than the rest? This season, the team plans to race this summer in Florence, Italy in the International BCS Dragon Boat Festival. To help raise funds for the trip, the PINK team partnered with local entrepreneur Tony Palmer, founder of TropicSport mineral sunscreen and skin care, which launched earlier this year. Tony was on hand to present a check toward the team’s Italy trip. Funds were raised through TropicSport’s affinity program, which donates proceeds back to non-profits and local community organizations. Dallas United PINK dragon boat practices are in full swing getting ready for the upcoming racing season. The team will be heading to Florence, Italy in just a few months. If you are a survivor or know someone who is, Dallas United PINK is for you. Come join them on White Rock Lake on Saturday mornings from 8-10 a.m. and don’t forget to wear sunscreen. Photo courtesy of Dallas United Crew The Dallas United PINK breast cancer survivor dragon boat team receives a check from local entrepreneur Tony Palmer, founder of TropicSport mineral sunscreen. One Response to "Cancer survivors headed to Italy"